Each year around 64,000 construction workers in the UK sustain an injury at work, with over 20% resulting in an absence from work of over 7 days. 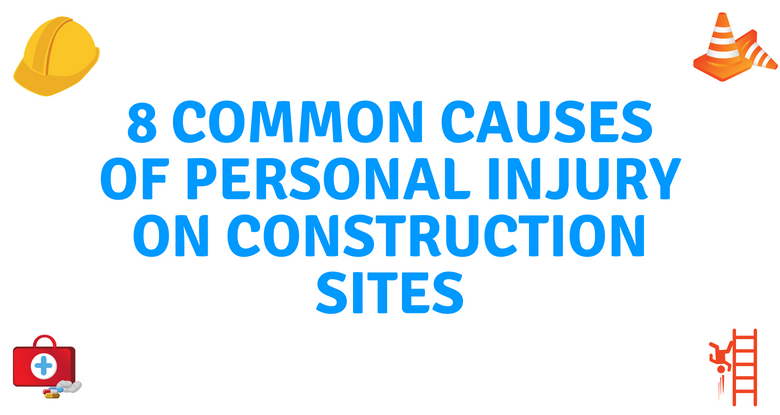 These are one of the most common causes of injury to construction site workers. Over half of all reported injuries in the Construction sector in 2016 were due to falls. Injuries sustained by falls can be split into two categories. The first is a fall from height and the second is a fall on the same level, also known as slips and trips. Unfortunately, the risk of falls, slips and trips come with the territory of working on a building site. It’s not uncommon to find floor openings, incomplete roofs, and surfaces that don’t have strong support structures. The reliance on ladders and scaffolding also increases the risk of falling. Although falls are common, there are several measures that can be taken both by employers and employees to help minimise the risk of experiencing a fall. Using appropriate equipment that can help prevent a fall including guardrails, harnesses and safety net systems. Keeping the working areas well lit so that any holes or hazards can be seen easily. Maintain a tidy workspace and get rid of any clutter – materials left lying around are one of the most common reasons that people suffer trips on a construction site. Ensure workers are wearing the correct footwear and that said footwear has good traction and grip. Follow safety regulations for ladders and scaffolding. Train employees on appropriate regulations and ensure that they are aware of health and safety measures. On any given construction site there is a host of electrical systems, half-completed piping as well as flammable materials and chemicals. It’s common knowledge that electricity and water don’t mix, but it’s still an issue on construction sites. While these types of injury may be one of the less common types of injuries sustained on a construction site, they can prove fatal. To avoid a fire fuelled disaster make sure you report any potential fire hazard to the onsite manager or supervisor. Construction sites are filled with heavy machinery, vehicles and large, heavy materials. Getting caught in or between any of the above can result in the worker getting crushed, and potentially fatally wounded. Often these types of accidents occur when materials collapse onto someone, or a vehicle traps someone against a wall or a miscalculation results in a worker getting trapped inside a piece of heavy machinery. The best way to avoid such accidents is to always be aware of your surroundings and follow any safety precautions that are suitable to the environment you’re in. Wear gloves, jewellery or long sleeve shirts around machinery with moving parts. Place any part of their body next to or on to the moving parts of a piece of machinery. Work in the swinging area of a rotating piece of machinery. Using applicable safety equipment as and when necessary. Maintain a safe distance from energised parts of machinery. Cover or highlight any exposed wiring and keep them away from liquid. It is the duty of the construction company or site manager to ensure that the construction site remains safe for all workers, this includes guarding against electrocution. Failure to do so could provide grounds to make a personal injury claim on the part of the employee. Stack materials properly – this will help stop them sliding or moving of their own volition. Stay clear of suspended loads or platforms holding heavy materials. Always secure tools to avoid them falling onto fellow workers below. Using tethers either to attach the tools to yourself or to a nearby piece of scaffolding is one of the best ways to do this. If applicable, wear the correct safety equipment including safety goggles, and high-vis protective clothing. Anyone who has worked on a construction site will tell you that it is physically demanding. Whether you are lifting heavy materials in blistering heat, braving blustery conditions to ensure the job is finished or working overtime to ensure the deadline is met, working on a construction site can be tough. Carrying out manual labour in all weather conditions can take a serious toll on a worker’s body. Working in the sun for prolonged periods can result in heat stroke, which, in severe cases can lead to heart, brain or kidney damage. Meanwhile carrying out construction work in the winter months always carries the risk of hypothermia or frostbite which can lead to workers losing their fingers or toes. In order to combat the weather and tough conditions, it is the duty of the construction company to provide adequate protection. against the elements in the form of protective clothing, as well as regular breaks. Trenches are often a necessity on building sites both big and small. They are often needed when laying the foundations of a building. If a trench collapses it can cause catastrophic damage, both to the construction site and the workers caught up in the accident. In some cases, a worker may be struck by the object that caused the trench to collapse, whilst on other occasions, the worker or workers can get buried under the dirt from the collapsed trench Trenches are often necessary on construction sites. If a trench collapses while a worker is working inside, they could get hit by the object that caused the trench to collapse. In more severe cases, they may get buried under the mud of the collapsed trench. In a bid to prevent such accidents occurring, ensure the trench is fully supported and that the supports have been constructed properly. Any defect in the support structure should be reported immediately. Repetitive strain injuries occur as a result of a repetitive motion putting pressure on the body’s bones and muscles. Construction activities such as screwing by hand or sawing by hand can cause such injuries as can operating heavy machinery like jack-hammers. In order to prevent these types of injuries from happening, it’s important that regular breaks are taken and that any feelings of discomfort are reported to the line manager or site supervisor. As a result of health and safety failings, there are approximately 130,000 lost days to workplace injury in the construction sector per year.